Brain Spam: Split Pea Soup: Great for tastebuds, not so much for hair. 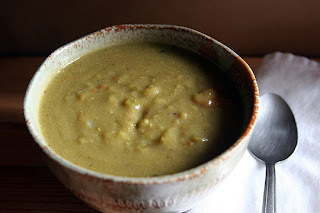 Split Pea Soup: Great for tastebuds, not so much for hair. Dude. So I'm basically a carnivore, right? I love veggies and carbs and all, but when it comes down to it, nothing wins me over like protein. (Unless it's cheese. Or kittens. But the latter not for eating, obviously.) So when I come across a recipe that is mostly made up of not-meat, and I'm raving about it, you guys should know that it is SERIOUS. I found this recipe on Food and Whine, which is a lovely (Canadian!) food blog with lots of other recipes I'll be exploring. The only change I made was to subsitute some chicken broth in for the water. This serves about 4 as an entree (serve with a nice salad and toast points, maybe) or 6 as an appetizer. This is the kind of soup that makes one happy about chilly weather. It's healthy, easy, and satisfying. What more could you want? Try it now!!! You can also make this soup with pork shoulder. This meat is fatty but, the soup comes out delicious! I cut all the fat off my pork shoulder and it still gives it a very nice taste and it has more meat then by using ham hocks. I recently got a slow cooker so I can't wait to try this recipe - you make it sound so yummy!